Every office needs to relieve the pressure of the job. The only thing better than shooting hoops is shooting hoops at your co-worker's head. 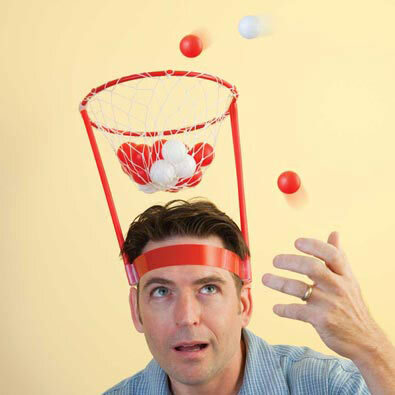 Fasten on the one-size-fits-all hoop and toss the 20 balls into the basket. 9-1/4" diameter. Stands 11" tall on your head. Made of plastic. A frantic wind-up game of beat-the-clock! Try to insert all of the shaped pieces into the correct slots before the timer runs out. When your time is up, the pieces pop out from the slots and you must start all over again. Includes pegs, score pad and storage drawer. Track your success with your tokens on the score pad. Storage drawer holds pieces when not in use. Up to 5 players. No batteries required. Measures 9" x 5" x 2". Instructions included. Recommended for ages 5+.